https://sep.yimg.com/ay/yhst-33477391359232/bluehead-wrasse-thalassoma-bifasciatum-blue-head-wrasse-6.jpgBluehead Wrasse - Thalassoma bifasciatum - Blue head Wrasse ModeratePeaceful75 Gallon7.1 inchesYesCarnivoreCaribbeanLabridaeSmall 1" - 2"
The Bluehead Wrasse is a cigar shaped fish with a blue head and green body. These fish have two bands of black separated by a band of white just behind their head. Bluehead Wrasse has paddle-like pectoral fins, which allow them to swim quickly. They are always on the move and are great fish for fish-only tanks. They are very active. The Bluehead Wrasse is a salt water fish and found in Indo Pacific and Caribbean regions. The Bluehead Wrasse goes through extraordinary color changes from juvenile to adult. The Bluehead Wrasse is a medium maintenance fish. A moderately trained aquarist can handle it. The Bluehead Wrasse makes a wonderful addition to the right type of marine aquarium and can live for many years. They are easy to keep but they are sensitive to poor water conditions. You should provide good water filtration and keep up on frequent water changes. Bluehead Wrasse does not bother corals but it will eat crustaceans and invertebrates. Bluehead Wrasse is a high energy fish and does best with frequent daily feedings to keep up with its energy expenditure. The Bluehead Wrasse is a carnivore and likes to eat variety of meaty treats including frozen mysis, saltwater feeder shrimp, squid, scallop clam and other crustaceans. It is very active during the day, enjoying a lot of rockwork with nooks and crannies for retreating as well as for sleeping at night. Bluehead Wrasse also enjoys resting on a sandy substrate and may burrow into it when frightened. Maximum Size: The Bluehead Wrasse grows up to 8 inches. General Size Specifications: The small size will come to you generally 1 to 2 inches; the medium generally 3 to 4 inches; the large generally 5 to 6 inches. Minimum Tank Size: The Bluehead Wrasse prefers a tank of at least 80 gallons with plenty of places to hide & swim. Water Conditions: Keep water quality high (SG 1.020 - 1.025, pH 8.1 - 8.4, Temp. 72 - 78� F). 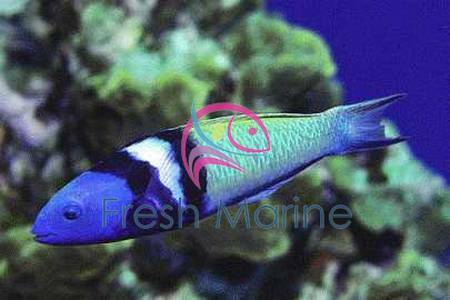 Diet: Bluehead Wrasse is a carnivore and likes to eat Variety of meaty treats including frozen mysis, saltwater feeder shrimp, squid, scallop clam and other crustaceans.